This week I received the newest stitchery of the month, by Kathy Schmitz. I love this one, was the perfect design for my beach room and I think it will be a great gift for the beach lovers. I did mine as she did, I liked the simple pillow with the frayed edges. Of course I aged mine, I do like the primitive look. I also made some pumpkin flat pillows. I wanted to try something I could use to hide and keep it simple, as well as easy to leave in places. I got a bit carried away with the size and they ended up more prim than I had planned, but once I start making something, I never know where it will take me. 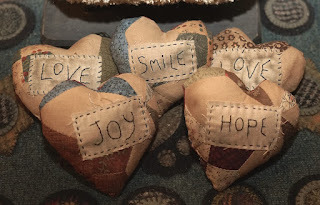 I think for the Facebook group DSmiles4miles, I will try some smaller wool ones and use the fun faces that I paint on rocks. These are so fun, I had to place them in areas around the house. I also made some more message hearts. 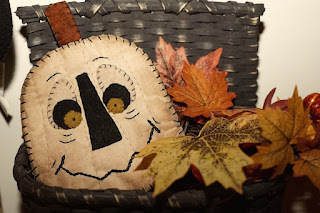 These will be gifted since they are prim, but I will do more with seasonal fabrics. I always like to try things first, then I can see what I do and don't like, so I can improve on them. 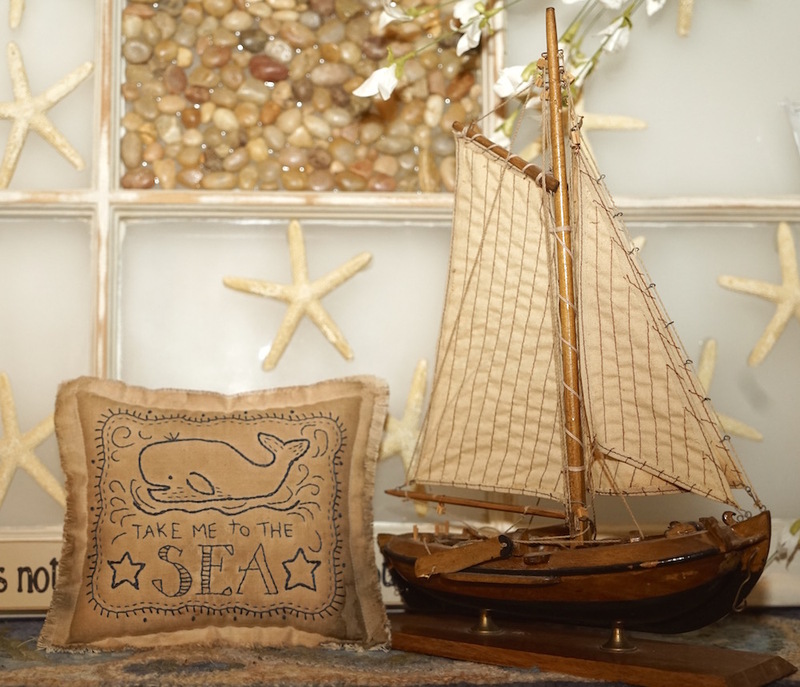 That little whale pillow is too cute! You get so much done!!! All very sweet. Love that pumpkin, I may have to be inspired with your concept and see what I can come up with!. Wish I'd kept up with Kathy's stitching club that is s sweet design. Wow, it just started pouring here really coming down sounds like huge raindrops. Had a lovely sunset with a few clouds but they just have just really rolled in. May have to fire up the fireplace tonight. Wonderful pillow, I like the staining too. That ship is nice and perfect displayed beside your pillow. The pumpkin and hearts are nice too. I loved your little whale pillow so much I had to go get the pattern, lol. Beautiful makes, Debbie! Wow you have been busy! Love the whale pillow! Others have chosen their favorites, but I can't. I like them all! And the great settings you used to display them. Those are all so whimsical and charming. Yu have a special creative touch, even when using a pattern.